There is some change in Tax Regulations that on first glance, will affect 2 REITs listed on the SGX. Lippo Malls Indonesia Retail Trust (LMIR), an Indonesian Retail Mall trust that provides a 9.4% dividend yield, announced that the Indonesian Government passed certain amendments to the regulations regarding payment of income tax on income received or earned from land and/or building leases in Indonesia effective from 2nd Jan 2018. This means if you are like LMIR, which received or earned from land or building leases, there will be a 10% income tax on the gross amount of the land value and/or building leases. Previously, property owners such as LMIR are not liable to pay this tax charges, as its paid by LMIR’s tenants to a third party operator. This third party operator does the maintenance services for LMIR’s properties, such as cleaning and maintenance of utilities. The third party maintenance company collects service charges and utilities recovery charges from the client. After this changes the tenants will have to withhold income tax on service charges and utilities recovery charges. This will have a material impact to LMIR and their shareholders. Based on the proforma calculations, this will have a 7% drop in net income available for distribution and dividend per share. The 3.2 cents was derived from LMIR much lower last quarter results. Given this, we made a -7% adjustment to the DPU just to be safe. In all honesty both 9.4% or 8.8% looked attractive but this is because the price have fallen from 0.38 to 0.335 cents. Prior to the fall LMIR was trading at 8.4% yield. When DPU falls, the shareholders demand the same dividend yield of 8.4%. 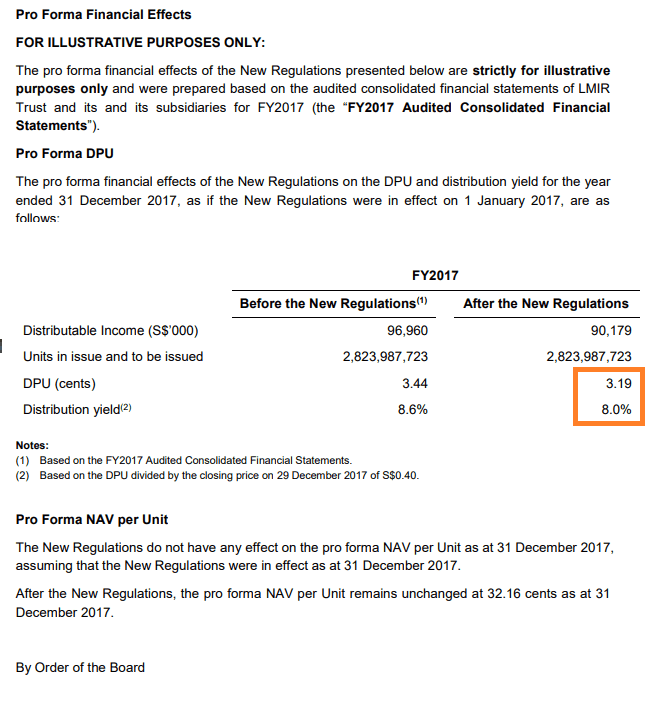 Given the DPU to be $0.0294 now, the share price needs to go down to give that same 8.4%. So if we divide 0.0294/0.084 = $0.35. This price is higher than the current traded price. Per CIMB report, post this change, LMIR will no longer outsource the operational management of the mall to a third party vendor. This change will take time and take place in FY2018. It would seem this means that LMIR will be able to recover some expenses previously paid to the third party maintenance operator. Some how I think what will happen is that LMIR will see their expenses change. As the tax was paid to the third party operator, and this might all be passed to LMIR as their property management expense. If they manage this themselves, cost may stay the same or optimize. But this is an additional overhead for the manager as the malls are pretty spread out and its not something they have a competitive edge in. Does this 10% Income Tax on Land and Building affect First REIT? When the news came out I asked First REIT whether they are affected. Their reply was prompt but they were checking with their tax consultants. I think the structure is a bit different for First REIT it is under a triple net lease, where the master lease tenants Lippo Group pays the maintenance and utilities. So there is no material impact there. The impact of these tax changes are heavy because rental revenue is bread and butter of REITs. When there is a reduction in revenue for a period of time, in a place that the property operates in, the value of the property will be affected as well. From the unchanged net asset value, it seems to indicate that this effect will be short term in nature. It is just a shift in how tax is accounted. This is not the isolated case where tax changes affect the REITs. You can read my article on the change from Business Income Tax to VAT affect REITs like MGCCT and Capitaland Retail China, which have properties in China. In that case, China tried to implement a flat tax system where the tenants will try to claim back the tax credit. While the tax is on MGCCT’s rental revenue, they might be able to passed some of the tax to the tenants, and the tenants claim back some tax credits. Taxes are complicated, and they will happen so its a risk. And its not a slight on one REIT. What we should be evaluating is the competency of the manager in assessing some of these acquisitions. Some countries provide great net property income yield, but they are filled with these tax and political regime uncertainties. Yet the managers think its a good idea to acquire a property over there. Taxes also affect non-REIT business. Its just that when your whole segment is based on rental, the effect is greater. I provide a list of common High Yield Singapore Dividend Stocks that gives dividend yield of 4-10% on my FREE Dividend Stock Tracker. The prices are updated daily and you can see the change in dividend yield as the price changes. You can access it here. I created a Google Spreadsheet that let’s you consolidate and track your portfolio by transactions. You can enable the price to update automatically and then review your portfolio often. It is FREE and you can take a look of my current portfolio in this Stock Portfolio Tracker here. You mentioned no material impact for First Reit but yet you have divested your holdings. Would you mind to share reason? 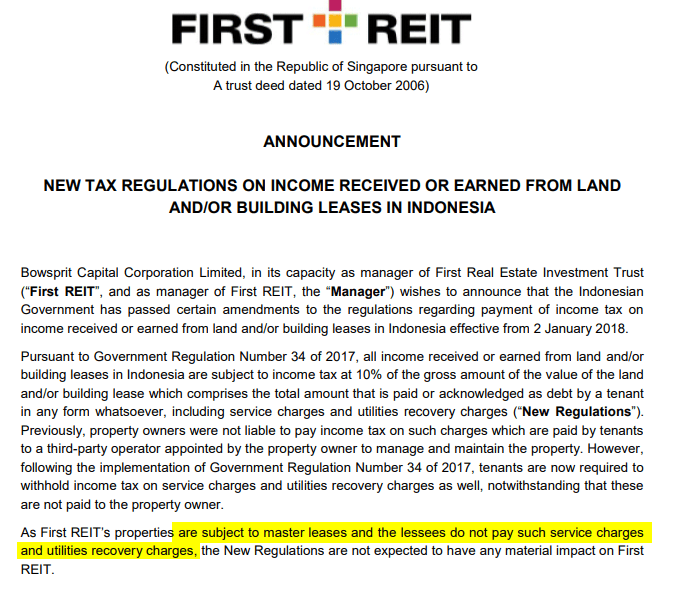 I divested the moment i remember First REIT was also in Indonesia, after I got a reply from the management that they are checking with the tax authorities. This was before the announcement by First REIT. Is this share still worth buying now? There is a depreciating currency, rising interest rate, and also a challenging retail situation. What’s the worst that could happen to Lippo Mall REIT if the situation in Indonesia worsens (depreciating currency, rising interest rate, and also a challenging retail situation)? Is it possible they could just close down? Is it just a waiting game for the Indonesia economy & currency to recover, and the price will bounce back? It depends on the dynamics of their property. If the property are really valuable they would always command some value, how much i think depends very much on the potential cash flow the property can generate in the future. Prices are going down because in terms of Rupiah the future cash flow is much less.